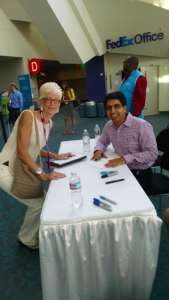 I met Sal Khan of Khan academy today. Sal is world famous and his company, non-profit, online tutoring website that is funded by Google and The Gates Foundation. I met him at the national NACAC conference in San Diego. My big idea that I shared with Sal, a former hedge fund manager, was that US colleges could offer to sell shares, like a publically-held company, to investors. The investors could be alumni, companies, and public citizens. This idea could fund Need-based scholarships, eliminating the need for student loans one day. The underlying philosophy is that American colleges are our countries crown jewels and every American may want to own a share of them.